Cabins: can offer private sessions in cabins or on decks (summer) mobile classroom. Meadow: summer private sessions available outside, capacity 20 private. Upon Request with at least 48 hour notice. 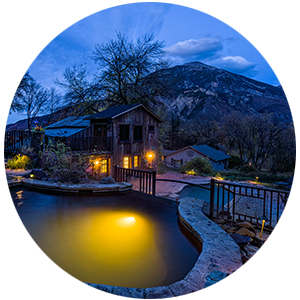 We have a massage studio located near the Hot Springs where we can host one massage at a time or one Couples massage at a time. Please call the office at (970)963-2846 to book. Avalanche Ranch is the perfect venue to either host a retreat OR participate in a retreat. If you would like to HOST a retreat please direct inquiries to molly@avalancheranch.com. If you are interested in ATTENDING a retreat please click here for more information.